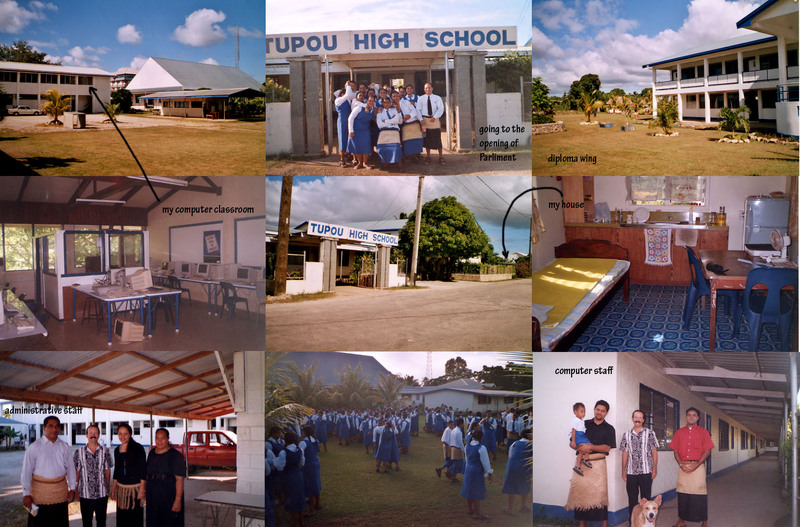 I was teaching at Tupou Tertiary Institute in 2005, at the Fasi Mo Afi campus which is right next to the downtown business district. 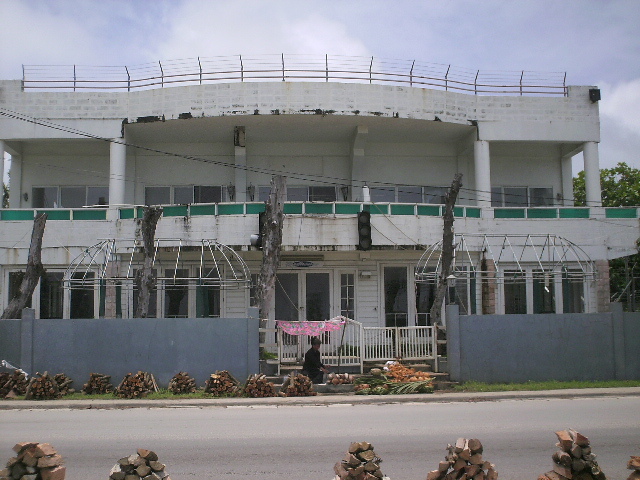 This is the area which was mostly burned down during the 'democracy riots' of November 2006. I guess I'm glad that I was not there during that period, as the riot mostly took place right next to my house! 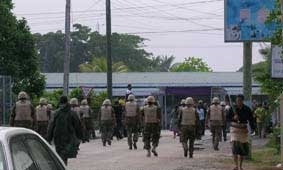 You can see the Australian Army marching right in front of TTI in this news photo. It was an odd time in Tonga, as the Tongans are usually quite reserved and tend to keep all their feelings 'bottled up' rather than express themselves. In ancient times, they were very good warriors, having conquered all of Samoa, Uvea (Wallis and Futuna), and much of Fiji at one time. But this riot seemed so uncharacteristic of Tongan behavior. The initial outburst was caused by Parlimentary inaction on government reforms that spurred a limited demonstration, which grew as some took advantage of this opportunity to vent their revenge over personal and racial greviences. Many hard working Indians and Chinese lost their businesses, and a rather shady character's hotel bore the brunt of the locals pent up anger downtown. The results left the central business district burned to the ground. 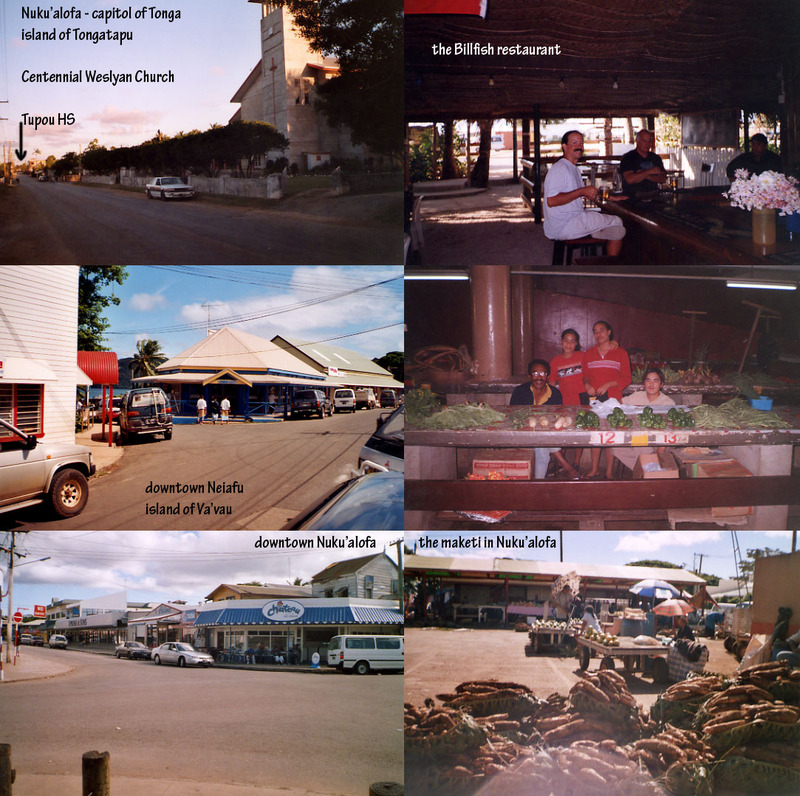 Years later many business returned to their old locations with shiny new buildings along the main North to South road which is Taufa'ahau Rd. This comparison is not before the riot and after, but before the 2008 global financial meltdown and after. In each comparison we have the 2007 photo on the left and the 2014 photo on the right. 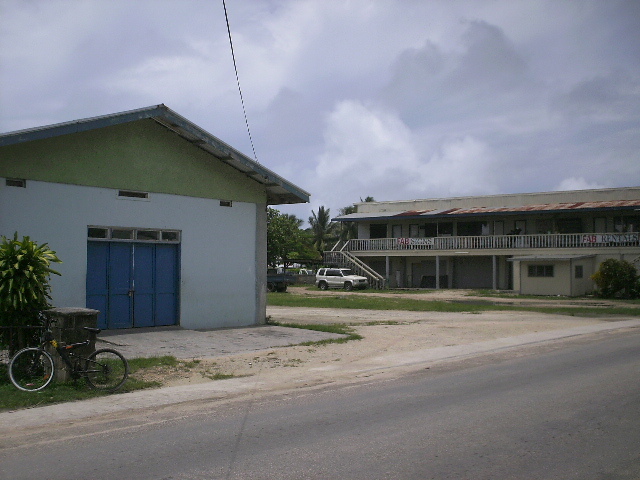 Here is the corner of Taufa'ahau Rd at Wellington from 2007 where the phone company had moved into the old liquor store, and then the south end of that same block in 2014. Given that the previous TCC location is now a huge brand new four story mostly-empty building, the odd comparison emerges: there had been a lot of businesses that couldn't survive through the financial recession from 2008 to 2014, thus many are boarded up and some are now under construction. This could mean that financial times had improved spurring this work, or that things had gotten so dilapidated that something had to be done. There's no denying that the recent image looks a lot less appealing than what one could see 6 months after the riot. When I went out to take the 2014 photos this is not at all what I was going after, but it is what you see and I don't know quite what to make of it. The traffic here is more horrendous than ever. Tongans keep buying cars and drive them constantly, even just to run 200 yards to the store. No one parks their car in an orderly fashion, just pull over and park anywhere. During the morning rush hour it is bumper to bumper, stop and go, with no stop lights. There are no traffic laws really, the police only get involved after an accident. 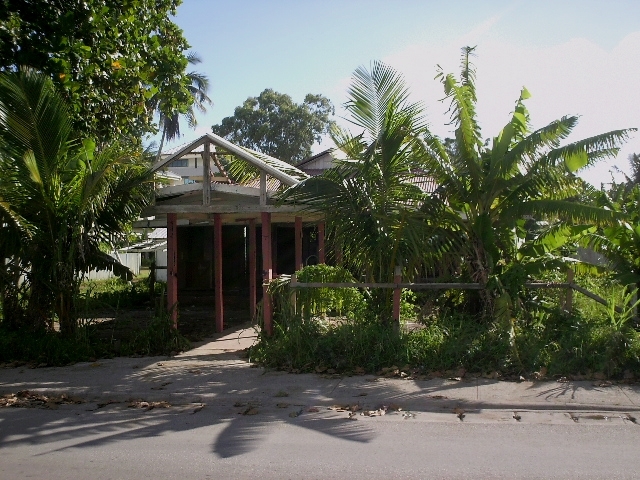 Here's the little club I used to play at in 2005 along the waterfront. It looks to have been closed for quite a while in 2007. Too bad as it was a cool place to hang out back in 2005, unless the owner was drunk. The place is obviously beyond any hope of restoration at this point. It seems that people have taken everything, even most of the wood. I think this would have to be the only place that had any American jazz since there was a nice jazz pianist at the Dateline Hotel a number of years earlier. I enjoyed playing here, had some good times and met some interesting people. Too bad the jazz jam session with Tupou V did'nt happen (he played some jazz piano from time to time). 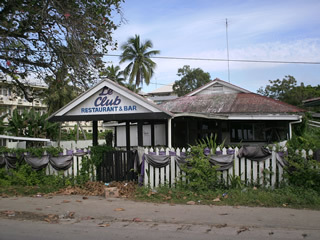 I know the Bounty Bar in Neiafu, Vava'u hoped to have some jazz there, and then I heard they sold out too. 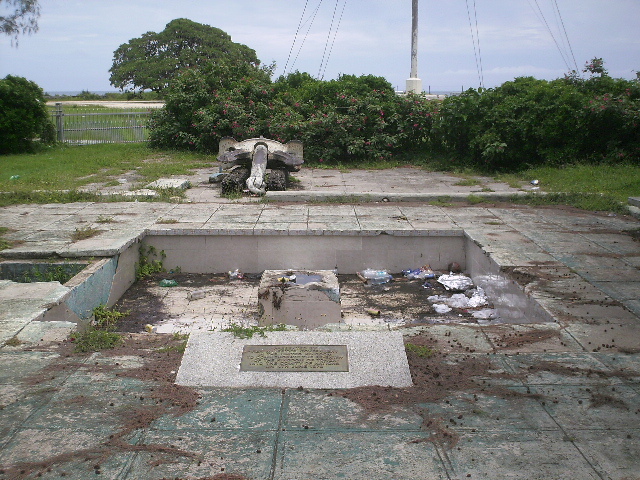 This is the downtown monument to the HMS Dolphin. The smiling dolphins have always been a fixture of the downtown waterfront, and their pool has always had this rediculous filthy appearance, even before the riots. 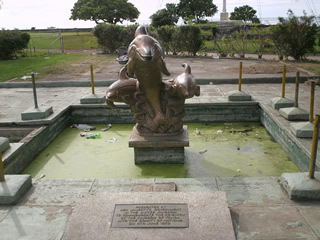 The Dolphin and her captain Wallis visited Tonga in 1767, the third known European visitors to Tonga. I think that was the last time anybody cleaned this fountain and it has never been seen to be working by anyone I have met. Still, the dolphins seemed to be happy. Now they are either scrap metal or an adornment to someone's backyard. I don't know when they were taken, but it is a shame just like so many things in Tonga. They don't have much of anything here and when they get something, well they seem to give no respect at all and just destroy it. Then they are back to having nothing again - a comfortable status quo? Just behind the Dolphin monument is the Vuna pier, where I used to go swimming. The wharf has always had "the unsafe of the surface" problem but it was'nt really much of a concern. 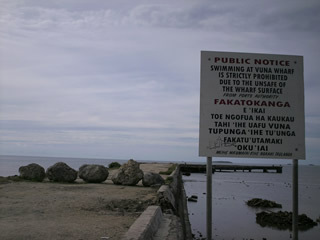 Now, it seemed to have become a concern as this sign indicates no swimming was allowed any more. In contrast to the urban blight seen in most of these comparisons, there is a nice new cruise ship pier funded by our friends the Chinese. We get about 16 cruise ships per year coming in from Europe, USA, and Australia. The tourists come into town and spend a little money here. Unfortunately sometimes they come to Tonga on Sunday, and the Kingdom is 'closed'. The places left to swim right in town would be much less desirable. There is the one little spot down the way with the steps into a small protected area where there are usually small kids playing, splashing, and crying about having to leave and go home. I would think the addition of this cruise ship dock would really make more of a difference than it has. On the day one ship comes in all the local places hire musicians who are playing to attract foot traffic, but there is also a band playing on the dock so many people don't even leave the ship. 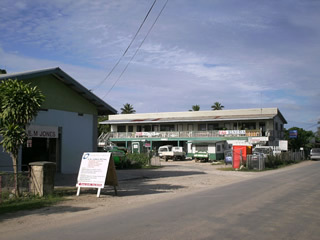 All along Salote Road a new business district had sort of grown up replacing the downtown. It came and went. Here is an EM Jones hardware business and a Friendly Island bookstore warehouse that I think was funded by overseas donations. Both businesses suffered a big loss during the riots, but came back into business here along the Salote strip. There were quite a few new businesses along this stretch of road as well. I had wondered if these new locations were going to be a permanent expansion, or just temporary. It turned out to be the latter. All of them have returned to the central business area and these Salote Rd locations are mostly empty after that. 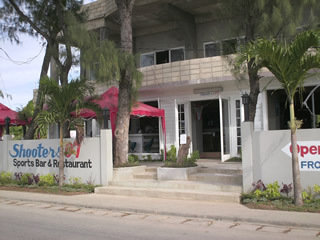 There were half dozen new restaurants along the waterfront, the biggest one this new sports bar called Shooters. Pretty nice, downright luxurious by Tongan standards even. They had a nice menu and kitchen, with the type of bar food that I know American's love. It was renamed into Roadhouse and then went out of business. They were not alone. I had a conversation with a longtime successful bar owner who explained how most of these new places and many old ones did not survive the financial meltdown of 2008. Things have stayed bad for about 5 years. The new downtown area did get 4 new nightclubs, replacing the ultimate in seedy waterfront bars, Wanda's. I kind of miss Wanda's, though. But the new places make a nice people watching vantage point.